Live Shrimp Three Feet Under A Popping Cork Is The Bait Of Choice. Local Folks Call It Paradise! 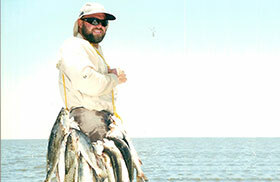 Speckled trout are showing up on the oyster reefs in the interior bays all along the gulf coast. This week I had three speck trips and all three were very good trips. Tuesday morning, I picked the guys up from the log cabins and headed out towards the barrier islands where we been catching some nice speckled trout. The wind was calm, and the water clarity was great. I find the water salinity is very high for this time of the year. It has been running anywhere from a 15ppm to 20ppm in the interior bays. That is a normal reading for the beach however for the inside that is high. The trout like to hang out in a high salinity during the summer months when they are laying their eggs because the heavy dense water will help to hold the eggs afloat when they are laid. This allows the males to swim by and spray the eggs and fertilize them. One thing I know about each spring when the summer season is getting started is that, we never know why the trout show up at different spots every year. It could be the level of salty water, it could be that the bait is heavy in one area, it could be because the water temperature or clarity is better at a location, who knows why they show up at various times and different areas each year. Now once the water temperature gets to a certain point and the summer season is in full swing the trout will be everywhere along the barrier islands. 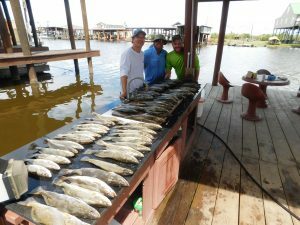 This is the time of the year that you must be careful when and where you go if you want to catch substantial amounts of speckled trout. When you go is important because you do not want to find yourself leaving the camp with a fifteen to twenty mile an hour wind out of the south because the surf will be high and stirring up all that sand and with an incoming tide the water on the oyster reefs will dirty. Now on the other hand, if the surf is high and the tide is falling, well the dirty water is falling out to the gulf and that will allow the oyster reefs to maintain some clean water. Sometimes paying attention to details can make the difference between having a nice fishing trip and a great fishing trip. 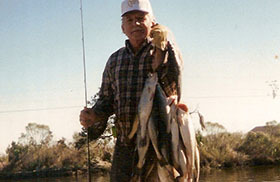 Much too often people leave the camp go fishing and catch a box of speckled trout and can not tell you the reason why they were biting on that day and that time of the year. I can not tell you how important it is to start keeping a log regarding what you caught on every fishing trip you go on, where you fished, what the tide was doing and what month of the year it was. This will create a reference for you to look back on to see what you did the year and years before. That reference will give you a clever idea to where to start looking for the fish every spring and throughout the summer months. I can’t say that you will be able to set our clock by the times and locations, however you will be able to get a general idea as to where to start looking for the bite you are looking for. I can promise you that in years to come you will want to throw your history log in the trash can because it is not a guaranteed science, however it will give you a good head start as to the time of the year and the conditions you started catching and where they were. Remember being patient and learn to enjoy your day on the water regardless of how many fish you catch. Once you do that, you are well on your way to becoming a better angler. 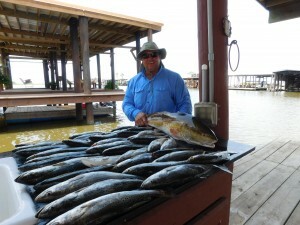 If you caught a box of speckled trout and red fish every time you left the dock there would not be any challenge to go fishing and you would be robbed of the excitement of wondering if you were going to find the fish on that day. I am kind of glad that I don’t slam the fish every time of go fishing because that is what makes it so great when you do have a wonderful day on the water. Ok the next thing I want to talk about is using live shrimp verses flipping soft plastics during this time of the year. I think it is ok to use soft plastic during the chilly winter months because all the bait shrimp has left the interior bays and marsh for the cold season. The live shrimp for the most part will go out to the gulf and spend the winter in the deeper water because the water is warmer out there. Because of the shallow waters on the inside of the barrier islands the water tends to get colder faster during the winter months because the air temperature transfers the cold temperatures to the water quicker. During this time of the year I like to switch over and using soft plastic because there is no bait left for them to eat. 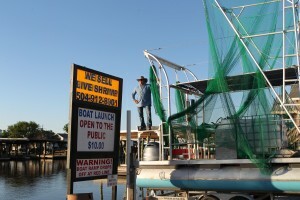 This is the time of the year that we are using live shrimp for catching speckled trout. I have about ten thousand live shrimps in my tank right now. I started selling live shrimp two years ago and it is going great. People are coming from all over now buying their bait from me. I have a state of the art live well tank that has not only the best filtration system on the market, but I also have a refrigerant system now that will keep my water temperature at a perfect sixty-five degrees during the hottest part of the summer. Water temperature during the summer months is very important because they can not take water temperatures that get too high. That is with out a doubt the best bait during the summer months. Relax into the Bayou lifestyle with our on-the-water cabins! Our family-friendly cabins are clean, comfortable, and right on Lake Hermitage where you can enjoy fishing, catching crabs or shrimp, or any of the other numerous local recreational activities. Learn more about staying in our cabins today! 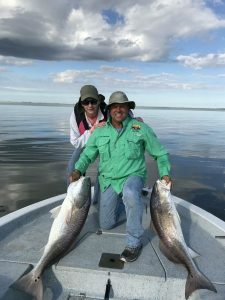 Whether you are looking for daytime speckle trout or redfish charters or nighttime airboat fishing charters, we can help! Our guides love working with visitors of all ages and skill levels, and they'll make sure you have an incredible experience on the water. Learn more about our charters today! Check out a gallery of images from previous guests to Bayou Log Cabins! We love taking pictures of our guests reeling in their big catch. Our guides will be sure to grab that perfect picture for you, too, so you have bragging rights back home or at the office. 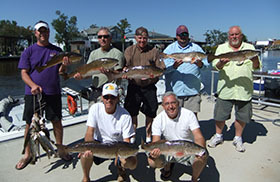 You'll love these photos from previous fishing charter excursions! Ready to experience Bayou Log Cabins for yourself? Whether you want the ultimate fishing experience, a relaxing vacation for the family or a little bit of both, this is the place to be. Get in touch with our team today and we'll help you create the ultimate vacation experience! Find out more about booking with us. 200 W. Kass LN. Port Sulphur, LA.